FEAUTURED IN HARPER’S BAZAAR BRIDE INDIA – JUNE 2014 . FEAUTURED IN WEDDING WOWS MAGAZINE – DECEMBER 2013 ISSUE. We have been feautured again in Wedding Wows magazine December 2013 issue. You can read the full article here and enjoy the reading. merge the fashion and documentary styles of photography. experience and shoot rather glamorous images of the bride and groom. 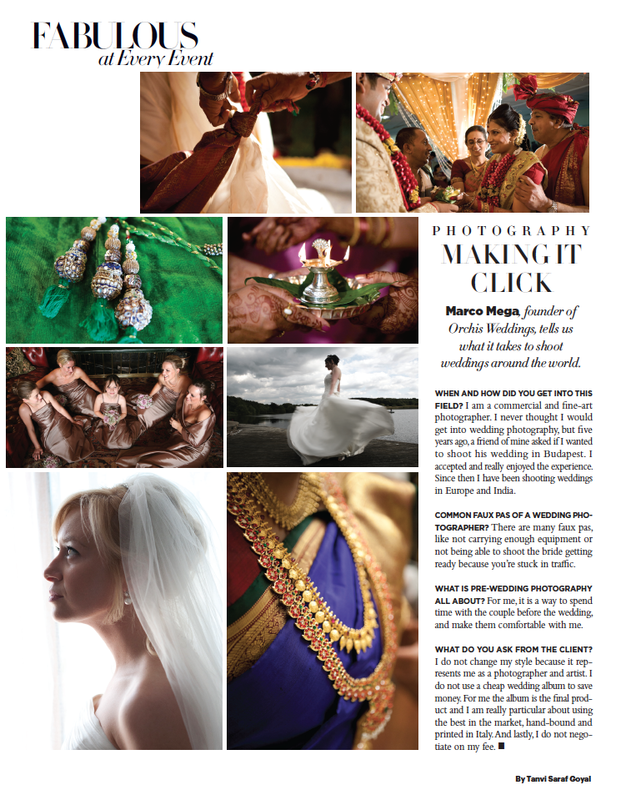 photographer Marco, who set up Orchis Weddings, talks about those delicate details. How did you find your calling in the field of wedding photography? locations in Europe and India. What is the difference between regular wedding photography, candidphotography and documentary style of photography? loud “big smile” or “cheers”, interrupting a natural moment. observer telling the story of the wedding, capturing emotions, humor and tensions. beautiful woman on this Earth, so let her be! What distinguishes your work from that of other photographers? why during the shoot I always use a second camera to capture only close up shots. Are there any new wedding photo trends? a more high fashion edgy look. How do you adapt or keep up to the changing trends in your field? hire me for the style and aesthetics I will bring into the photography. Describe your first project. How did you feel at the end of it? can not miss some important shots. company that caters to the wedding photography market. How often do you interact with the client before the wedding and why? camera. Pre-wedding shoots can be very useful for this purpose. aspects, and again few more days before the “day” for the last updates. was very happy with her decision. Do your clients give you a list of shots that they want? What kind of relationship do you share with your clients? some moments of fun together. best results. Our albums combine the latest technology with the craftsmanship. the story and not on other distracting design elements. Do your clients get to make the wedding album with you? the couple can see all the pictures and share them with family and friends. Any particular wedding that you enjoyed shooting? Describe it. was like being in an Indian Fairytale. What is the best compliment you have received thus far? Have you faced any challenges as a wedding photographer? decades; hence it should be the most valued part of the wedding.